Bonjour a tous!!! Hello to all!!! I am back now but while away I have passed the baton to someone else for my return to blogging. …Introducing Eleanor Leech. 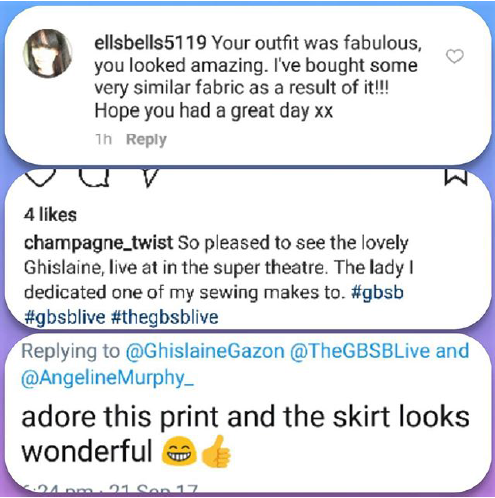 I “met” Ellie on Instagram and she “met” me at the Great British Sewing Bee live in September 2017. Ellie was in the audience of the Super Theatre where I was interviewed by the funny Jenny Eclair. That day I was wearing this striking number Vogue 9075. Ellie got in touch that same evening, telling me I had inspired her to buy a similar fabric to make a similar garment. 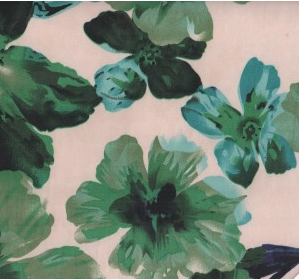 We both view sewing and design the same way: The fabric dictates the make, not the other way round. 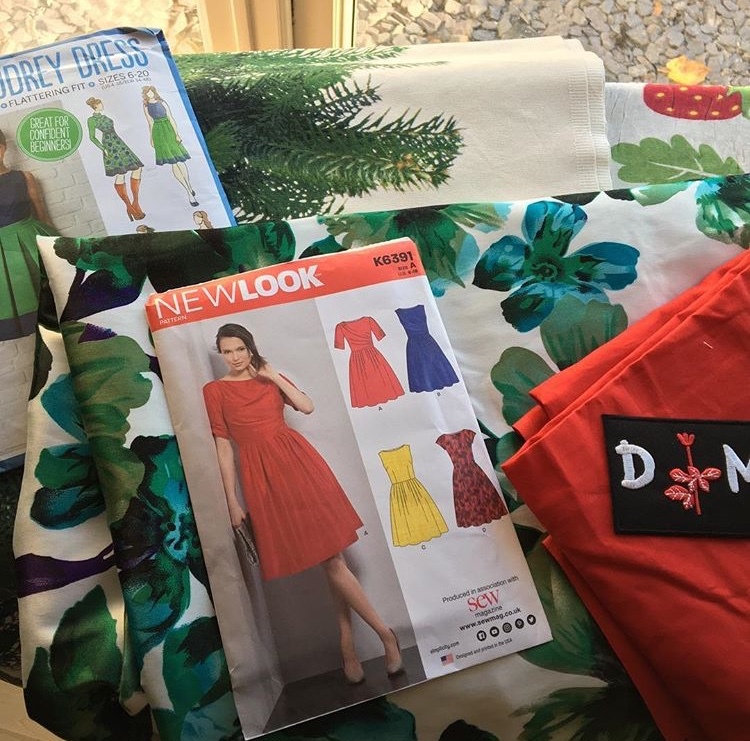 I didn’t start dressmaking until I hit 40 when gifted a sewing machine by my lovely chap but have discovered a passion for it that makes me wonder what I ever did with my spare time before now??! I started off by creating little outfits for my baby daughter, then progressed into making for myself. Beginning to get braver, I like to test myself with each garment. I’ll tell you another time about the zip being inserted into the crotch of a gold catsuit for a friend!! 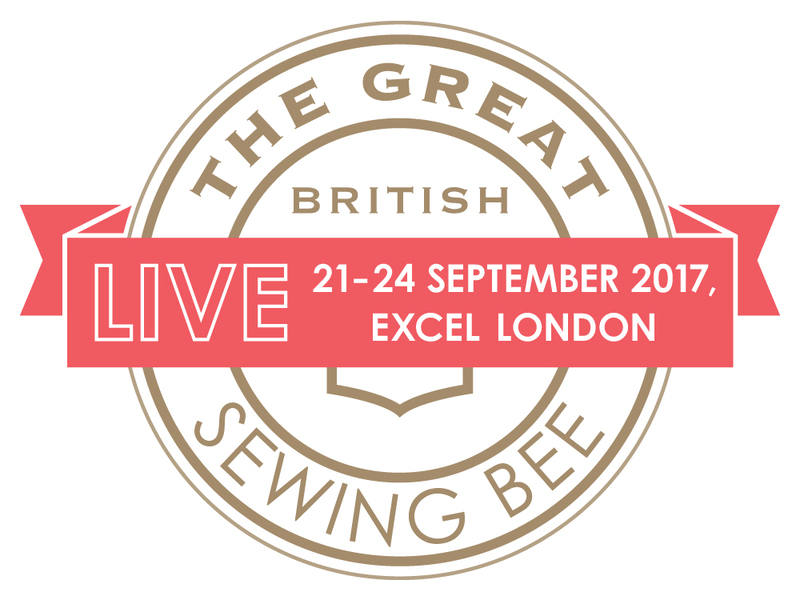 On a birthday surprise trip to to the Sewing Bee Live last year, my only resolution was to not buy any more fabric; my stash is about to invade the loft. 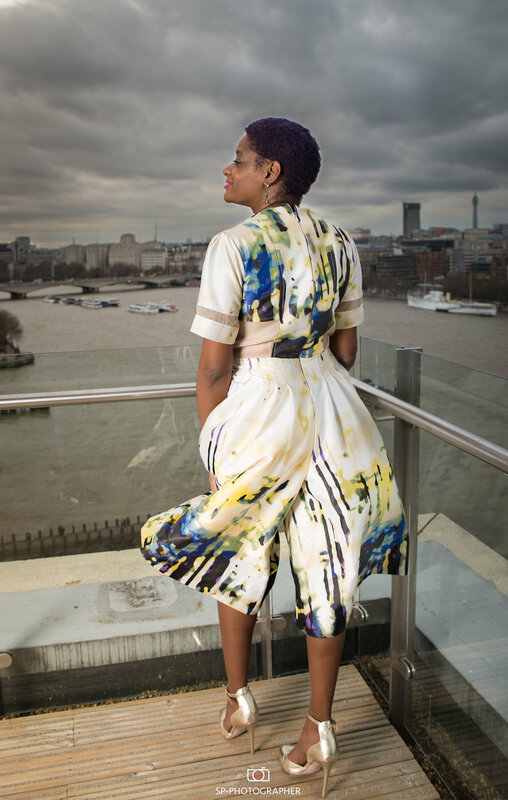 But one visit to the Supertheatre Event and seeing Ghislaine’s amazing culottes jumpsuit changed that instantly. I’ve usually stuck to simple cottons for sewing but I fell in love with the sateen’s finish and how it responded to the stitched down pleats. A fantastic combination of looking fabulously stylish and yet comfortable. As luck would have it, whilst still at the show I found a perfect cotton sateen from Sew Sew fabrics. had the stretch and vibrant sheen that I admired in Ghislaine’s make. the halls??!! I wanted to deck myself out in a new outfit!!!! My go-to garment is a dress. I’m a working mum of three, so coordinating separates is beyond my capabilities most mornings! Coffee and mascara being a high priority after making sure everyone is in the right place with everything they need! I love feeling feminine but low maintenance dressing and minimal ironing is a bonus. And pockets are a must! 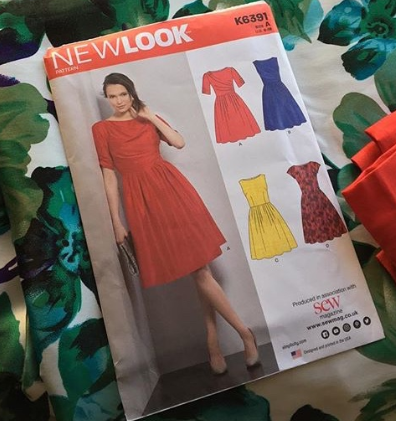 Fabric always drives my projects so I was really fortunate to find the perfect pattern, given away with a magazine just a few weeks later NEW LOOK K6391. It showcased all the details I loved in the jumpsuit with an added drape to give my wiry frame some curves. A new texture to me, I found cotton sateen tricky to work with at first. I’m much more used to simpler lines and pressing pleats to hold them before stitching. I had a real dilemma after constructing the bodice. 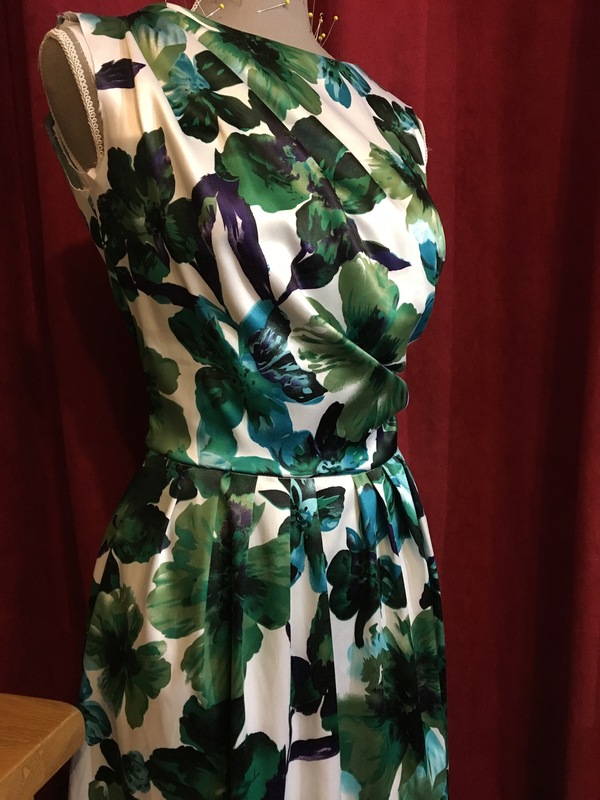 It looked so beautiful that I was loathe to add sleeves, even asking the ever supportive Instagram sewing community for opinions! It stood on the mannequin, one arm off- one arm on, for a whole week while I deliberated! 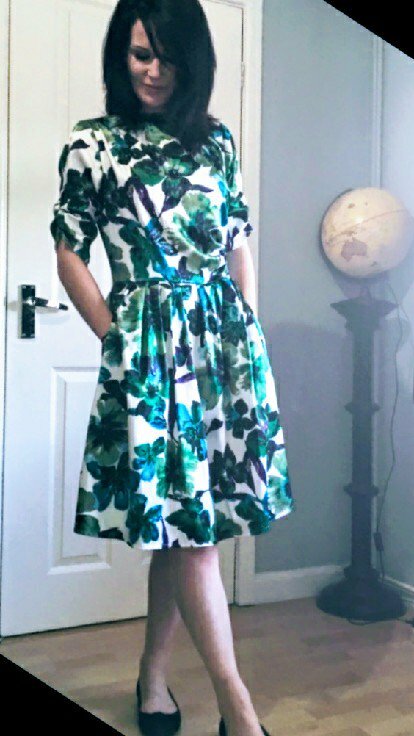 I persevered with the sleeves (unpicking them at least ten gazillion times in an attempt to balance the pleats), and I’m glad I did as this is now a stand-alone garment – just add shoes, and no need to add arm-covering cardigans and spoiling the silhouette. I wanted to make the pockets a little more striking and stable so instead of using the same fabric, opted for a stronger and brighter purple cotton from the stash. It’s made for a flashier and, dare I say it, slightly more practical feature with less stretch. I’ve worn this several times already. We save too many good things for special occasions. I’m all for wearing something that makes you feel good every day, especially if it has all important pockets! Thank you Ghislaine for the inspiration and for making me want to try something new. It was a real challenge and it feels like a true accomplishment. Thank you Ellie for finding the inspiration in what I am passionate about and make. Whenever I doubt of my contribution you do spring to mind. 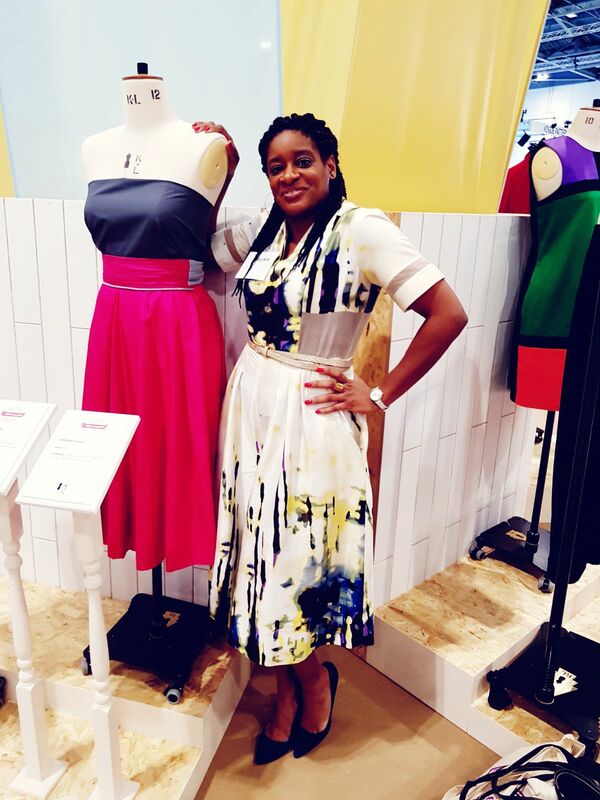 May you have many more stylish wears out of this and may you continue to be inspired by your sewing community. My favorite past time is browsing Instagram and be amazed by what the sewing community do. Thank you, merci to all for sharing and contributing. Who inspires you? Is it a friend, a teacher, a family member or someone famous? Or is it someone fictional, a character from a book or a movie? Pick one person who inspires you and spend a little time in their company. Such s beautiful dress! Green is my favorite color, & green/ purple is my favorite combo! 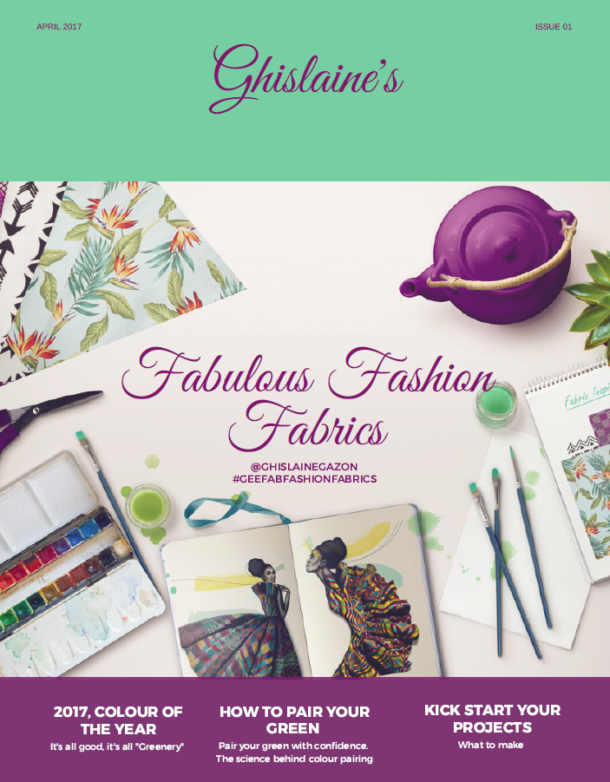 Keep up the fabric job!